Arabs (descendants of Ishmael) were free and lived in their own homeland forever , while Israelis (the descendants of Jacob A.S) were in persecution and exile from their homelands. Genesis 17:10-11 This is my covenant with you and your descendants after you, the covenant you are to keep: Every male among you shall be circumcised.You are to undergo circumcision, and it will be the sign of the covenant between me and you. Genesis 17:12 For the generations to come every male among you who is eight days old must be circumcised, including those born in your household or bought with money from a foreigner–those who are not your offspring. Genesis 16:1-4 Now Sarai, Abram’s wife, had borne him no children. But she had an Egyptian slave named Hagar;so she said to Abram, “The LORD has kept me from having children. Go, sleep with my slave; perhaps I can build a family through her.” Abram agreed to what Sarai said.So after Abram had been living in Canaan ten years, Sarai his wife took her Egyptian slave Hagar and gave her to her husband to be his wife.He slept with Hagar, and she conceived. Genesis 16:11 The angel of the LORD also said to her: “You are now pregnant and you will give birth to a son. You shall name him Ishmael, for the LORD has heard of your misery. Genesis 16:15 So Hagar bore Abram a son, and Abram gave the name Ishmael to the son she had borne. Genesis 17:19 Then God said, “Yes, but your wife Sarah will bear you a son, and you will call him Isaac. I will establish my covenant with him as an everlasting covenant for his descendants after him. The Covenant was with Issac only for his descendants after him, that verse is clearly indicating this matter, the covenant that is only for Issac (A.S) and his descendants are different from that of Ishmael (A.S) and his descendants, so other covenant was with Ishmael, thus God Almighty is bringing two mighty nations on earth under one faith. Remember that God is not making two or three religions or doctrines by doing this! Many Christians and Jews believe, this is because there is something in this covenant that make children of Israel as chosen people!. This pride and arrogance came to the tribes of Israel later and they made this covenants and twisted it with writing lies and made the world to believe they are chosen. They slandered Ishmael and his mother by corrupting the books and concealing the truth. Being from the Children of Abraham (A.S), through Issac (A.S), the Israelis became arrogant and stubborn , when someone read rest of the Bible with intelligence and full reasoning will understand that God Almighty knew the nature of transgressing of the children of Israel. So God Almighty given them heavy covenants and Laws to discipline them and guard their chastity, yet they become corrupters , practicing magic, killing prophets, receiving bribery and dealing with usury etc. This is the reason covenants were put heavily on children of Israel than any other nations. But some people prefer to believe their imagination rather than the reality that is still clear from the Books. Because it is clear that Abraham (A.S) and both his sons were circumcised their foreskin! Genesis 17:23 On that very day Abraham took his son Ishmael and all those born in his household or bought with his money, every male in his household, and circumcised them, as God told him. Genesis 17: 27 And every male in Abraham’s household, including those born in his household or bought from a foreigner, was circumcised with him. Genesis 21:4 When his son Isaac was eight days old, Abraham circumcised him, as God commanded him. The Lies written in Bible regarding Ishmael and his mother is in order to incite racial concern, a chosen people feeling syndrome in the Bible writers! Genesis 21:12 But God said to him, “Do not be so distressed about the boy and your slave woman. Listen to whatever Sarah tells you, because it is through Isaac that your offspring will be reckoned. Comments: Sorry: Sarah has to listen whatever Abraham (A.S) is ordering her to do! Comments: Isaac (A.S) is not the Only Son, it was Ismail (A.S) who was taken to the Command of God to Sacrifice. He was the only Son Abraham (A.S) had that time in his very old age. That time God was testing the Sincerity of Abraham (A.S) to his Lord by asking to Sacrifice his only Son!. If Issac (A.S) was there, then this divine order and test would not come true. Genesis 22:13 Abraham looked up and there in a thicket he saw a ram caught by its horns. He went over and took the ram and sacrificed it as a burnt offering instead of his son. Comments: Only Ishmaelites, Muslims who celebrate this day and honor this Favor of God and Praise Allah and Exalt Him on this Occasion every year. No Christian or Jew revere this traditions, because, they know the truth that it was not Issac (A.S), but they rejecting it while knowing it! The question to 21st century Bible scholars is: How Issac became only Son of Abraham, when Ishmael was there? How come the Bible writer forgotten the living Ishmael (A.S)? Someone who doesn’t want to speak the truth wrote this passage. It was Ishmael (A.S) who was taken to Sacrifice as an offering for God. This is purposefully corrupted by the later Bible writers. To Remind: Jeremiah 8:8 “‘How can you say, “We are wise because we have the word of the LORD,” when your teachers have twisted it by writing lies? It is a clear proof from Bible that Ishmael (A.S) was tested for Sacrifice, but Christians claim, it was Issac (A.S). However, the verses Genesis 22 states it was Ishmael as he was the only Son at that time. And from his progeny all world will be blessed and all nations are possessed.. Comments: When I see so much corruption in Genesis, I remember the verse in Jeremiah 8:8!The above verse prove that Abraham (A.S) had only one Son at the time when God ordered to Sacrifice his son.-Ishmael and his descendants and followers of Abraham (A.S) from the nation of Ishmael are in higher in number than children of Israel..
WHO ARE THE GREATER MULTITUDE? Some people may claim Christians are Majority and so Christians and Jews make larger number than Muslims. I am not talking about the population of Christian Jewish world, rather understand that the verse in Genesis 22:17-18 speaking about those who keep the covenant, they are Muslims in such huge numbers. the believers who worship Only the God of Israel, from this three groups (i.e Christians, Muslims and Jews) and those who circumcise among them. Genesis 17:7 (also see 17:8) I will establish my covenant as an everlasting covenant between me and you and your descendants after you for the generations to come, to be your God and the God of your descendants after you. The everlasting covenant is the Greatest Law of all, and unfortunately Christians, changed it and worshiped Jesus Christ (A.S) and Holy Spirit (A.S) beside God of Abraham! 2-They shall be in righteousness and lovers of all Prophets (Abraham, Jesus, Moses and Muhammad and all other Prophets ,peace be upon them), they will follow all the Prophets who are appointed over them after Abraham (A.S), they do not rebuke the Prophets! The Jews always rejected and persecuted many Prophets, they even demonize their Prophets by writing lies against Prophets in their books, or to glorify some Mighty Prophets, they narrate other Prophets as deceivers!. The Lawlessness deceived churches, they broke greatest of the law, by saying Jesus and holy spirit are god and God share his glory and power with three and said Jesus paid it all, then rebuked Law and commandments of sacrifice and offerings, Churches were re-established in secular and pagan traditions and they found honor in it and following the ways of pagans incorporated to the faith. 2 Thessalonians 2:3-4 Don’t let anyone deceive you in any way, for that day will not come until the rebellion occurs and the man of lawlessness is revealed, the man doomed to destruction. He will oppose and will exalt himself over everything that is called God or is worshiped, so that he sets himself up in God’s temple, proclaiming himself to be God (False Messiah-God in flesh). Some Christians (Evangelists in America who are baptized by lying spirits) say: Mahdi is anti-Christ, but Mahdi is a man born to human. They must understand Islam or at least read Sura Ikhlas, to understand Islamic faith, before uttering foolishness like Mahdi is anti-Christ (Astaghfirullah)!, God of Abraham, Issac, Ishmael (Peace be upon them) and of Muslims is One God, neither Born nor begotten! and they do not worship any born gods! Only Jews and Muslims worship God Alone, and they do not worship Jesus Christ (A.S or holy spirit. ), on the other hand Jews slandered and reject Jesus Christ (A.S) though they circumcise their corruption and rejection caused them to cut off from the divine blessings with light and guidance . Paul and others went to preach gospel to Gentiles , though it was for the children of Israel who have studied Law of God. Because they were fit to receive the spirituality of the Gospel and it was not sent for Gentiles. Matthew 10:5-6 These twelve Jesus sent out with the following instructions: “Do not go among the Gentiles or enter any town of the Samaritans.but only to the people of Israel–God’s lost sheep. But some Bible scholars and pastors say, Jesus Christ (A.S) said to preach gospel to all nation by quoting another verse. They do not read the verse meaning together in context. Isa (A.S) was saying (According to Bible) to go and preach Gospel to the nations were the lost children of Israel live.Because Jews were living ,scattered in my nations! Matthew 24:15 ESV “So when you see the abomination of desolation spoken of by the prophet Daniel, standing in the holy place (let the reader understand),Daniel 11:31 ESV Forces from him shall appear and profane the temple and fortress, and shall take away the regular burnt offering. And they shall set up the abomination that makes desolate. Later, Barnabas depart from Paul, the Christians look Paul’s and rejected Barnabas’s Gospel. 1 Corinthians 2:18 Aramaic Bible in Plain English And we wished to come to you, I Paul, once and twice, and Satan hindered me. But later, Paul was hindered by Satan, and a lying spirit was in his mouth. Read 2 Corinthians 12:6-7 If I wanted to boast, I would be no fool in doing so, because I would be telling the truth. But I won’t do it, because I don’t want anyone to give me credit beyond what they can see in my life or hear in my message even though I have received such wonderful revelations from God. So to keep me from becoming proud, I was given a thorn in my flesh, a messenger from Satan to torment me and keep me from becoming proud. As a consequence the darkness over taken the path of Paul, lawlessness prevailed. Corrupt priests and leaders legalize Wine and Pork in Church though drunkard will not inherit the Kingdom. After centuries Gambling and other lawlessness spread in society. Jesus was made to be a god for the people, who set them free from obeying Laws and Commandments, though Paul mentions many Laws in his books about marriage, righteousness, women , family etc, yet the people took it out of context and Paul’s Message was twisted to make a New Path, that does not honor the Covenant of Abraham and Covenant of Moses (Peace be upon them), that shall be upon all nations generations to generations. The covenant of Abraham (A.S) through Issac was made perfected in Moses (A.S) for Israelis and the covenant of Abraham (A.S) through Ishmael’s progeny in Prophet Muhammad (s.a.w) for all nations until eternity. Moses (A.S) making it know to the people, the covenants made with all Prophets. I have yet many things to say unto you, but ye cannot bear them now.Howbeit when he, the Spirit of truth, is come, he will guide you into all truth: for he shall not speak of himself; but whatsoever he shall hear,that shall he speak: and he will shew you things to come. According to Deuteronomy 18:18 which is not fulfilled in Jesus christ (A.S) by his own words, we see that Jesus Christ (A.S) pointing to “that prophet” (the redeemer of the accursed) who will come after him. John 1: 19And this is the record of John, when the Jews sent priests and Levites from Jerusalem to ask him, Who art thou?20And he confessed, and denied not; but confessed, I am not the Christ. 21And they asked him, What then? Art thou Elias? And he saith, I am not. Art thou that prophet? And he answered, No. Quran 108:3 Indeed, your enemy is the one cut off. Deuteronomy 18:15 The LORD your God will raise up for you a prophet like me from among you, from your fellow Israelites. You must listen to him. The Good News John 16:7 But very truly I tell you, it is for your good that I am going away. Unless I go away, the Advocate will not come to you; but if I go, I will send him to you. They cannot chase him and arrest him! John 7:35 The Jews said to one another, “Where does this man intend to go that we cannot find him? Will he go where our people live scattered among the Greeks, and teach the Greeks? Which means He will raised to God and Will not be touched by enemies! As also Quran states!, rather they die in Sins. They should have believed in him as a Prophet and Messiah. John 8:26-27 “I have much to say in judgment of you. But he who sent me is trustworthy, and what I have heard from him I tell the world.”They did not understand that he was telling them about his Father. John 14:1-2 “Do not let your hearts be troubled. You believe in God; believe also in me. My Father’s house has many rooms; if that were not so, would I have told you that I am going there to prepare a place for you? Quran 2:140 Or do you say that Abraham and Ishmael and Isaac and Jacob and the Descendants were Jews or Christians? Say, “Are you more knowing or is Allah ?” And who is more unjust than one who conceals a testimony he has from Allah ? And Allah is not unaware of what you do. Quran 3:67-68 Abraham was neither a Jew nor a Christian, but he was one inclining toward truth, a Muslim [submitting to Allah ]. And he was not of the polytheists.Indeed, the most worthy of Abraham among the people are those who followed him [in submission to Allah ] and this prophet, and those who believe [in his message]. And Allah is the ally of the believers. Quran 5:72 They do blaspheme who say: “Allah is Christ the son of Mary.” But said Christ: “O Children of Israel! worship Allah, my Lord and your Lord.” Whoever joins other gods with Allah,- Allah will forbid him the garden, and the Fire will be his abode. There will for the wrong-doers be no one to help. The Bible clear says that those who do not circumcise will be cut off from his people, as they broke this order of God. So in Quran it says: 108:3 For he who hate you [(O Muhammad (Peace be upon him)], – he will be cut off (from every good thing in this world and in the Hereafter). John 14:5-6 Thomas said to him, “Lord, we don’t know where you are going, so how can we know the way?”Jesus answered, “I am the way and the truth and the life. No one comes to the Father except through me. John 14:8-9 Philip said, “Lord, show us the Father and that will be enough for us.”Jesus answered: “Don’t you know me, Philip, even after I have been among you such a long time? Anyone who has seen me has seen the Father. How can you say, ‘Show us the Father’? Some Christian try to say: Philip asking to show father, so Jesus is God!, But Father is not God, Father is Prophet Muhammad (s.a.w) the Heavenly Father. So Philip is not a wicked person to ask Jesus Christ (A.S) to show God among others, Bible verses are twisted to serve a lie! If Jesus claimed to be God, then they would have said: “We are like god”. But there is nothing in the Likeness of God! So Since Disciples say: We are like Jesus, then for sure to rebuild your understanding that Jesus is not God! Hebrews 3:3 Jesus has been found worthy of greater honor than Moses, just as the builder of a house has greater honor than the house itself. the Father , Son and Holy Spirit are not God or not one or not equal. The Father refer to Prophet Muhammad (s.a.w), the verse does not speak about showing God! 1 Corinthians 14;33 For God is not a God of disorder but of peace–as in all the congregations of the Lord’s people. Matthew 5:5 Blessed are the meek, for they will inherit the earth.Psalm 25:13 They will spend their days in prosperity, and their descendants will inherit the land. Psalm 37: 11 But the meek will inherit the land and enjoy peace and prosperity. Genesis 16:16 Abram was eighty-six years old when Hagar bore him Ishmael. The corrupt Priests , later changed the name of Issac (A.S) with Ishmael (A.S) to mislead people that, the blessings will come to all nations through Issac (A.S)! . Because this was the hatred they had against Ishmael and his descendants. As Jeremiah 8:8 says, priests writing lies in the scriptures. Because it is clear that God is speaking to Abraham regarding his son Ishmael (A.S), once the words about Ishmael (A.S) is over, then God mentions about Sarah and the glad tiding of her son (Issac A.S) and he will become a leader for his own descendants not for whole world! Genesis Chapter 17 Explains the Covenant was with Ishmael and his descendants who will become a great nation and will come the Final Prophet (s.a.w) in his line. The Covenant of Issac (A.S) was only for his descendants. This is the reason Israeli Prophets including Jesus Christ (A.S) did not come to all nations, but only to the Children of Israel (A.S). all nations on earth will be blessed through the progeny of Ishmael, because you have obeyed me.“Quran 21:107 And We have not sent you, [O Muhammad], except as a mercy to the worlds. Never recorded in any other books that Holy Spirit needing to hear from someone to speak to people. first hearing then speaking, which make receiving revelations and thus it was only unlettered last Prophet Muhammad (alaihiswalathu wa salam). Isaiah 42:10-11 Sing to the LORD a new song, his praise from the ends of the earth, you who go down to the sea, and all that is in it, you islands, and all who live in them. Let the wilderness and its towns raise their voices; let the settlements where Kedar lives rejoice. Let the people of Sela sing for joy; let them shout from the mountaintops. This is the truth, Bible books is contradicting one after another ,, because the later Prophets words adding truth into it, then some unknown people try to re-write it with human perception and inventing lies about God. The Book of Isaiah stands as a high proof against Judaism and Christianity. Because it though human hand intervene it, raising allegations against Jews and Christians and pointing the corruptions. Isaiah 1:21,23, See how the faithful city has become a prostitute! She once was full of justice; righteousness used to dwell in her– but now murderers! Your rulers are rebels, partners with thieves; they all love bribes and chase after gifts. They do not defend the cause of the fatherless; the widow’s case does not come before them. Isaiah 59:3 For your hands are stained with blood, your fingers with guilt. Your lips have spoken falsely, and your tongue mutters wicked things. Isaiah 2:5-6 Come, descendants of Jacob, let us walk in the light of the LORD.You, LORD, have abandoned your people, the descendants of Jacob. They are full of superstitions from the East; they practice divination like the Philistines and embrace pagan customs. Isaiah 2:3-4 Many peoples will come and say, “Come, let us go up to the mountain of the LORD, to the temple of the God of Jacob. He will teach us his ways, so that we may walk in his paths.” The law will go out from Zion, the word of the LORD from Jerusalem. He will judge between the nations and will settle disputes for many peoples. They will beat their swords into plowshares and their spears into pruning hooks. Nation will not take up sword against nation, nor will they train for war anymore. Isaiah 2:17-18 The arrogance of man will be brought low and human pride humbled; the LORD alone will be exalted in that day, and the idols will totally disappear. As quoted earlier, all the idols were disappeared and Only God Alone is exalted where Kedar lives and rest of the holy lands. From Morocco to Indonesia! Isaiah 3:11 Woe to the wicked! Disaster is upon them! They will be paid back for what their hands have done. Isaiah 5:20-24 Woe to those who call evil good and good evil, who put darkness for light and light for darkness, who put bitter for sweet and sweet for bitter.Woe to those who are wise in their own eyes and clever in their own sight.Woe to those who are heroes at drinking wine and champions at mixing drinks,who acquit the guilty for a bribe, but deny justice to the innocent.Therefore, as tongues of fire lick up straw and as dry grass sinks down in the flames, so their roots will decay and their flowers blow away like dust; for they have rejected the law of the LORD Almighty and spurned the word of the Holy One of Israel. Isaiah 8:13 The LORD Almighty is the one you are to regard as holy, he is the one you are to fear, he is the one you are to dread. Isaiah 9:2 The people walking in darkness have seen a great light; on those living in the land of deep darkness a light has dawned. The Light that is dawned with Jesus Christ (A.S) in Seir , after Mount Sinai with Moses (A.S). Then it shine forth fron Paran with Prophet Muhammad (s.a.w) in the area where Kedar lives. Isaiah 9:7-8 For to us a child is born, to us a son is given, and the government will be on his shoulders. And he will be called Wonderful Counselor, Mighty God, Everlasting Father, Prince of Peace. Of the greatness of his government and peace there will be no end. He will reign on David’s throne and over his kingdom, establishing and upholding it with justice and righteousness from that time on and forever. The zeal of the LORD Almighty will accomplish this. This prophesy comes on Prophet Muhammad (s.a.w), as God Promised Abraham (A.S) through his son Ishmael’s progeny, the 12 rulers will come from him. As the governments depends on his work (shoulder), even today Prophet Muhammad (s.a.w) is regarded as the “greatest Law giver” by United States Judiciary! Christians say it is Holy Spirit that will come upon his disciples, that will be with them forever. But John 12:35 reject this claim. John 12:35 Then Jesus told them, “You are going to have the light just a little while longer. Walk while you have the light, before darkness overtakes you. Whoever walks in the dark does not know where they are going. But the advocate as the Final Apostle of God, His teachings and his traditions are going to be with believers till eternity! Isaiah 42:4 King James Bible He shall not fail nor be discouraged, till he have set judgment in the earth: and the isles shall wait for his law. Some translators want to deceive people by avoiding the world “law”, because Jesus Christ (A.S) did not bring a new law, he followed the Laws of Moses, including his authority was according to the Law of Moses (A.S) read Hebrews for Jesus as High Priest in the Order of Melchizedek. Isaiah 10:1-2 Woe to those who make unjust laws, to those who issue oppressive decrees,to deprive the poor of their rights and withhold justice from the oppressed of my people, making widows their prey and robbing the fatherless. Quran Defends the truth: Quran 2:79 So woe to those who write the “scripture” with their own hands, then say, “This is from Allah ,” in order to exchange it for a small price. Woe to them for what their hands have written and woe to them for what they earn. Isaiah 11:4 but with righteousness he will judge the needy, with justice he will give decisions for the poor of the earth. He will strike the earth with the rod of his mouth; with the breath of his lips he will slay the wicked. Jesus Christ (A.S) did not come to Judge: John 12:47 “If anyone hears my words but does not keep them, I do not judge that person. For I did not come to judge the world, but to save the world. John 12:48 There is a judge for the one who rejects me and does not accept my words; the very words I have spoken will condemn them at the last day. Isaiah 63:9 In all their distress he too was distressed, and the angel of his presence saved them. In his love and mercy he redeemed them; he lifted them up and carried them all the days of old. Psalm 136:24 King James Bible And hath redeemed us from our enemies: for his mercy endureth for ever. ZAM ZAM WELL, OR WHAT?? 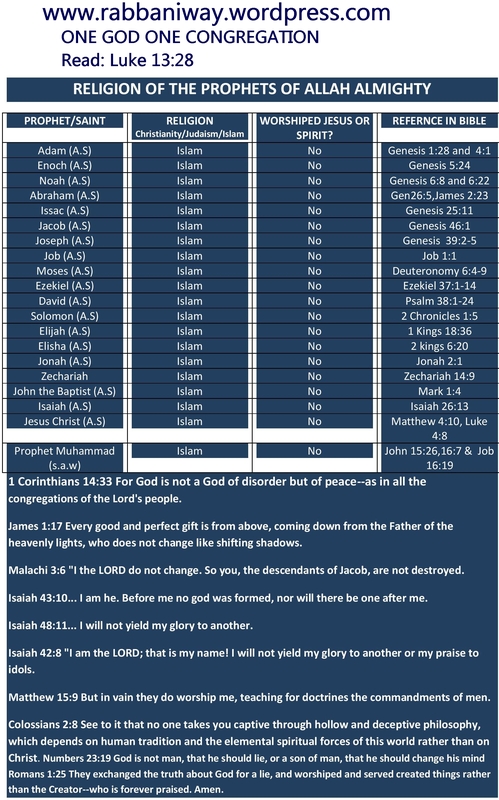 However majority of the Bible verses does not correspond with the core teachings of all Prophets. All chapters have some truth in it. and rest are misinterpreted and or altered! Many anti-Christ has appeared and many will come showing miracles and wonders, until last one comes. May this article benefit Christians and Jews, there are many good people among them. I wish for them that may Allah guide them to Straight Path and Truth. Because As Muslims we are ordered by Our Prophet Muhammad (s.a.w) to love all and to wish good for everyone. 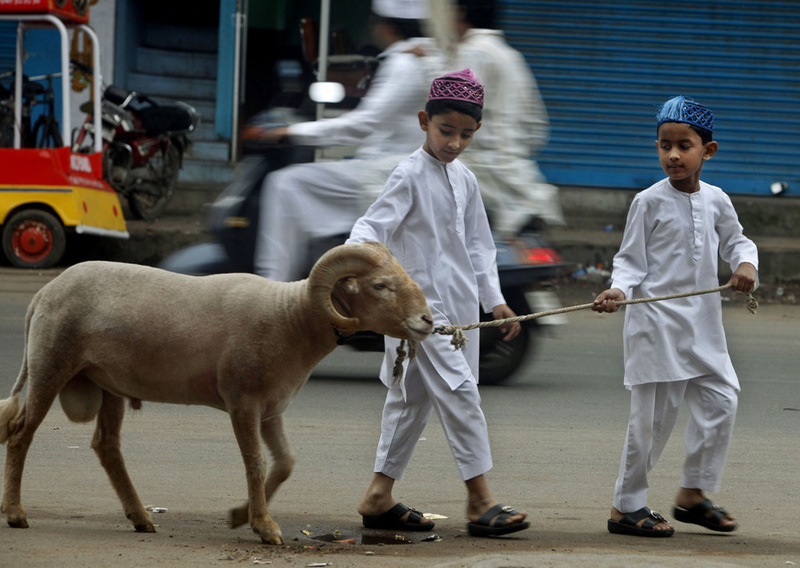 “None of you truly believe until he loves for his brother what he loves for himself”- Bukhari and Muslim! Going through Bible and re capturing the truth is like seeking diamond from deep mud, as so much corruption ,disorder in writings and alteration made it very difficult to find the true message, by the Spiritual Support from heavens, this weakest one try to reveal it to those who only believe in this book (Bible)! Abraham and IshmaelGensisIshmael or Issac?